Cherry's Prairie Primitives: Pin It Blog Hop!! and Giveaway!! 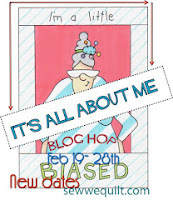 Pin It Blog Hop!! and Giveaway!! 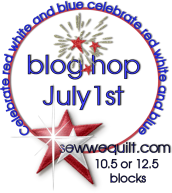 I Love all the Blog Hops!! 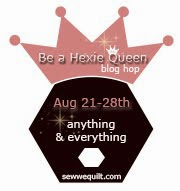 Thanks to Madame Samm of "Sew We Quilt" for all the super fun Blog Hops!! I always see so many beautiful creations that inspire me!! Kristen King of "Meadowbrook" is our super inspiring host. 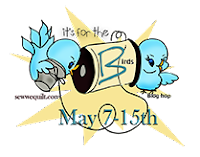 I was so excited to see what everyone created for the Pin It Blog Hop!! I really loved this ice cream cone and had wanted to turn it into a pincushion. It sat on a shelf for about 2 years. 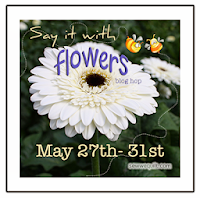 I guess it was waiting for this blog hop!! The mummy was a planter pot I had got as a gift from my kids one year so I thought I would turn it into a pincushion also!! Perfect to sit on my sewing table for Halloween!! 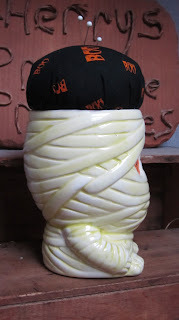 Then I thought, my Jack-O-Lantern would make a great pincushion or a great Giveaway!! Just leave a comment here and for an extra chance on Facebook!! Here are the other super creative ladies posting today!! I scream... what a lovely icecream! Yummy ice cream pin cushion! The mummy is fantastic! Thank you for sharing. Just sew sweet! Love your pin cushions. All your pincushions are so cute! I love the pumpkin! Love your pinnies! Thanks for sahring! Lovely pincushions, my favorite is the pumpkin. Too cute!! I just love whimsy - just think the mummy planter is a perfect pincushion! Ilove the cute ice cream cone. The pins in the mummy is great. but the Jack -o-lantern is ADORABLE.! I love it. Oh yummy ice cream, thanks for sharing! all very cute, especially the ice-cream cone! All of your cushions are so unique! Very pretty pin cushions, thanks for sharing! Your ice cream code pin cushions look almost good enough to eat! And your Jack-O-Lantern is just great! Thanks for the chance to win. Seasonal pincushions....what a great excuse to make more! I love the pumpkin. The mummy is appropriately scary and the icecream cone is just delicious! Well done. Such very cute pincushions. Love your mummy! Very, very clever! Makes me want to rummage around in my china cabinet for pin cushion type items. Thanks for sharing your creativity today. What gorgous pincushions - very clever! Fabulous pincushions... especially the pumpkin! So cute and perfect for different times of the year. The ice cream could be out for spring and summer and the mummy for autumn time. Thanks for a fun giveaway too. Ice cream cone looks very real. Have to be careful not to sample it. Vute ideas. So clever! I love them all. Nice pincushions! Thanks for sharing. The look so fun and cute. And Jack is just great! All your pincushions are cute! What a good idea to use ceramic pieces as a base! Thanks for sharing. They are all adorable! Love the ghostie...and that ice cream cone was MADE for this! Have fun! What super cute pin cushions! How cute! Tis the season for a little ghoulish fun, huh? My son is crazy for Halloween, too. Thanks for a great giveaway and the eye candy! I think it is just great how we can make a pin cushion out of something we have at home. There are sew many items that we all have that has been just waiting for us to use. 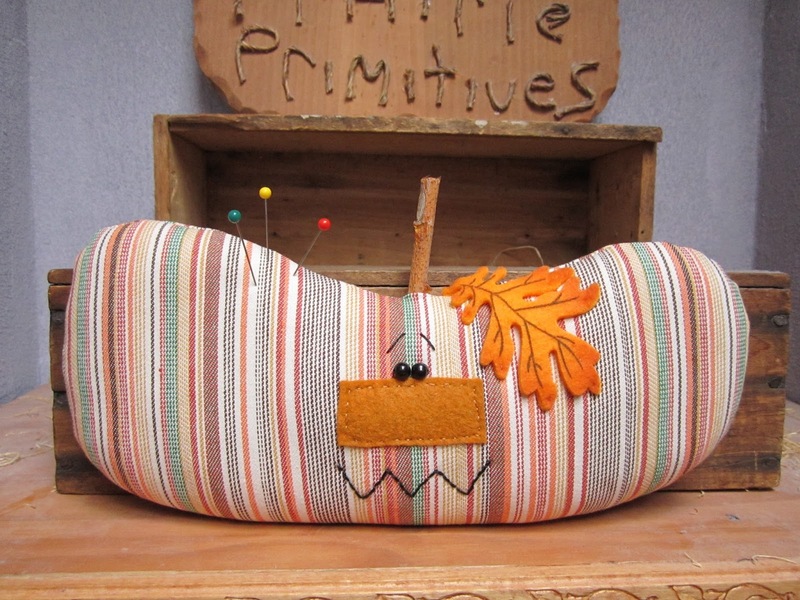 Great pin cushions and cute pumpkin too. Sweet and spooky! A perfect combination. Thanks for sharing your darling pin cushions. Solo cute, your ready for fall. I enjoyed reading your post very much. The ice cream cone is darling! Love the pumpkin too! What a good idea Cherry, I bet your kids like what you did with your gift they gave you ! The ice cream cone is my favorite, but I do love that cute pumpkin, too! Cherry that ice cream cone looks good enough to eat! The mummy would have been great for the wicked hop as well. That pumpkin is darling too! Great pin cushions and the pumpkin is extra cute. I like some non scary decorations for Halloween. Great idea to use the cone and planter for your cushions too. Very cute. I love your pumpkin. What a great doorstop it would make for the autumn too. Great ideas, now to just find a cute container to use. 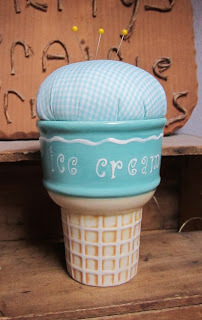 Oh, what quilter wouldn't love an ice cream cone like yours--cute ideas to use containers. I have a "lady" planter and could easily give her a rounded hat. lol Your pumpkin is really cute also. Thanks for sharing! Your ice cream cone pin cushion is so yummy. What flavour would that be? Definitely not vanilla. Thanks for sharing. LOVE the ice cream ! I love all three! The pumpkin is adorable! Love them all but that last pumpkin just sings to me. I especially like the ice cream pincushion! So cute... that ice cream cone looks so refreshing! Super cute pumpkin too. All are lovely. Awesome job! Thanks for sharing. Love the creative pincusions, very cute. The pumpkin is my favorite, I love everything about fall. 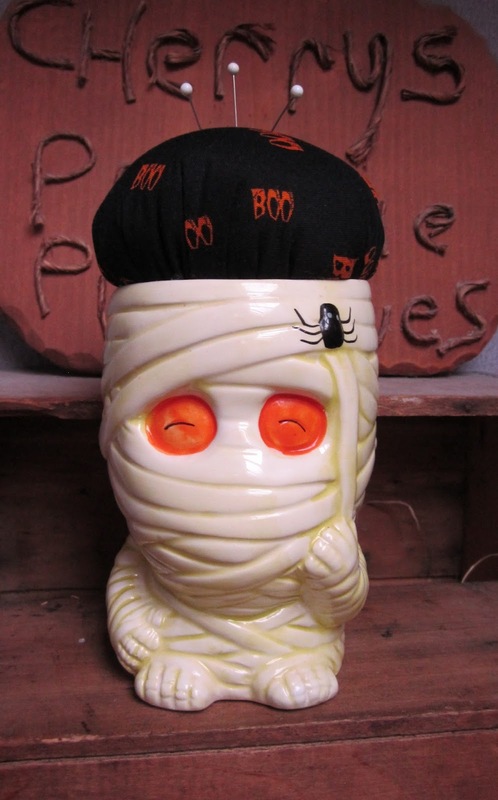 Hi, I am Dutch and I live in France, the halloween is for me a bit unknown, but I love to win our pincushion . Sew creative. I like them all. so stinkin' cute -- ice cream for ice cream, ghosts and pumpkins! do you have patterns for the witch boots and candy corn pillows?? Love it! You have me in the mood for apple cider and pumpkin pie! OMG!! I love the ice cream cone. I love all of them. You are so creative in a quiet way. You post your pictures and they are so cute. Thanks for sharing. Oh my, that mummy is the BEST!! The ice cream cone is awesome too and the pumpkin is just too adorable. Fantastic job on all your pinnies! I love your pincushions. They are all sew cute! Such cute pincushions! I love the ice cream cone. It looks yummy!!! From your site, looks like your getting ready for Halloween. Love the facial expression on the pumpkin! Nice work! Great pincushions. Love the ice cream cone. Such cute pincushions, especially the happy jack! Super cute ice cream cone. A very nice give away also. Really enjoying the hop. Great way to repurpose. Cute pumpkin. I made about a dozen cupcake pincushions to give away. They would go great with your cone. I love your mummy more though. Ready for Halloween. I hope you are in the Wicked hop too. The pincushions are adorable, thanks for sharing.. The mummy and the ice cream cone are perfect made up into pincushions. I really love the pumpkin - as a pincushion and by itself, too. I love these! Halloween themed crafts are my favorite. LOVE LOVE LOVE your darling pincushions!! How cute! and your pumpkin is adorable!! Oh my gosh those are some cute pincushions, thanks for the giveaway. Your mummy and my vulture would go quite nicely together. I love that mummy's face! Cute, cute pincushions! Your pincushions are adorable. Love the mummy and the pumpkin. So cute!! Thanks for the inspiration. Love that ice cream cone. Great idea to use it as a pincushion. Your Jack-O-Lantern pumpkin is neat! These are just too much fun. Being the Halloween junkie that I am, I love the mummy! Fun projects Cherry, love that punkin! how cute. Love the upcycling. Such unique pincushions. Love them. Thanks for sharing. They are all great - love the Halloween ones. Thanks for sharing and sorry I am late visiting. Sew cute. You are all set for Halloween for this one, matching the items you shared in previous posts. THX for the giveaway opportunity. Oh, I really love this pumpkin. Adorable pincushions. Love the pumpkin. I love your pin cushions, especially your jack-o-lantern. Now I am going to have to run around my house looking for things to make pin cushions out of. Love the ice cream and pumpkin. cute pincushions, thank you very much for sharing! They are just adorable. I love the ice cream cone. I have been with my husband for 25 years. We have 4 beautiful children 2 girls and 2 boys. My passion is creating unique hand sewn primitive bowl fillers, ornies and dolls with my very own one of a kind patterns and designs. I began creating for family and friends, expanded using Ebay and now my very own business. All Items are Made in America!!! Never miss a post "Follow by Email"
© 2005 to Present. All Rights Reserved by Cherry's Prairie Primitives~. Simple theme. Powered by Blogger.